There is an old fable about a young man who inherits three locked treasure chests from his father. One was a heavy chest marked “Talents” and was filled with ability, gold and jewels. With it could be bought all in the world. The second treasure chest was even heavier and marked “Compassion”. It was filled with magic rings that when worn, would let him feel the emotions of another. The third treasure chest was marked “Honor”. It was the largest and heaviest of the three treasure chests but the contents were a mystery. There were two keys given to the young man. One key was to open the chest marked “Talents” and the other was for the chest marked “Compassion”. The instructions that came with the keys said that “Talents” and “Compassion” were meant to be used. There was no key to the third chest and the instructions said “Honor” was a thing too easily squandered. To have the contents of that chest the young man must find his own key. As the story unfolds the young man goes out into the world and uses the chest of “Talents” wisely and carefully. Each time he did he was given a parcel of land until in time he came to possess the entire world. Now owning the world, the young man turned to the chest called “Compassion”. One at a time he put the magic rings on his fingers so he could understand the hopes and fears of all the people in his world. He became a great ruler and champion of justice. For the third box marked “Honor” the young man tried and tried to find a key to open the chest. He ordered his people to find a key to open it. None did. Many offered to break into the chest for him, but he always refused saying violence was not a key to honor. After many, many years the now old man said to his people “I have not found the key to “Honor” and I can not rule this world or the hearts of the people without it. So he began to give away what he had gained through his use the chests of “Talents” and “Compassion”. He gave every person a piece of land and a magic ring until he had given everything away. Then the old man thought to himself my “Talents” are gone and my “Compassion” is spent. I have nothing to give to my son except this chest I can not open. With that thought, to his amazement the lock on the chest called “Honor” suddenly fell off. This is when the old man knew, Honor is not something to be spent or used, but to be kept. The key to honor is to keep it, always, and pass it on. He was so glad he had not given in and broken into that chest. And so it has been so with me. I went in search of money, success and fame and was blessed with all three. I obtained them in abundance but was actually more unhappy than I had been at the start. As I grew older, experience of living and pain from my own mistakes taught me and broke the seal on my heart. Then I began to be much more compassionate of others. When money, success and fame were not of great meaning to me any more and when helping others became one of my primary motivations, I began to find the honor that I had sought my entire life. 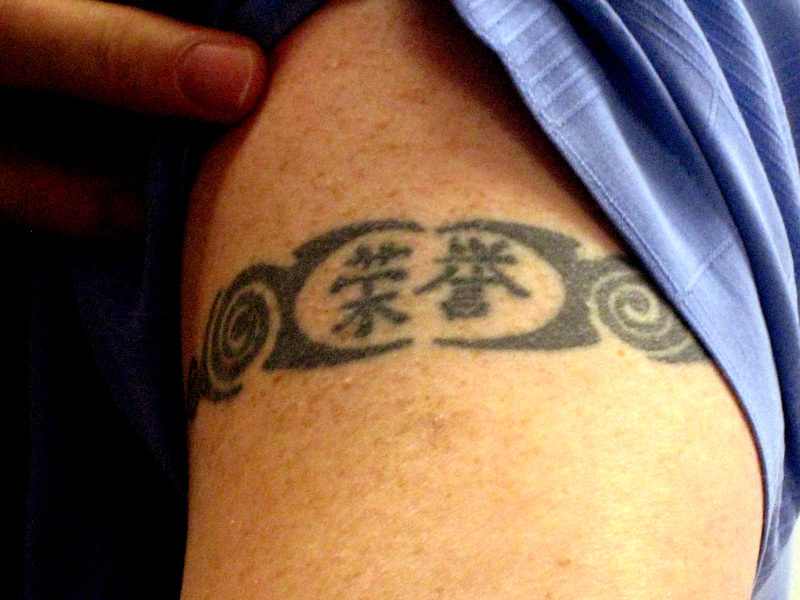 So now the tattoo on my left arm of two Chinese characters that mean “Honor” are beginning to match the man whose skin they were inked upon years ago. It is my sincere hope that my son can see clearly what I have become and through that example encourage him to pay little attention to things I once was. Within I feel gratitude in great quantity for the insight I have today. And in doing so I must thank the trials and tribulations that taught me the lessons that brought me to where I am. This entry was posted in Life, Self Awareness, Wisdom. Bookmark the permalink.